A pair of raids Thursday targeted powerful Chicago Alderman Ed Burke's offices at City Hall and on the Southwest Side. 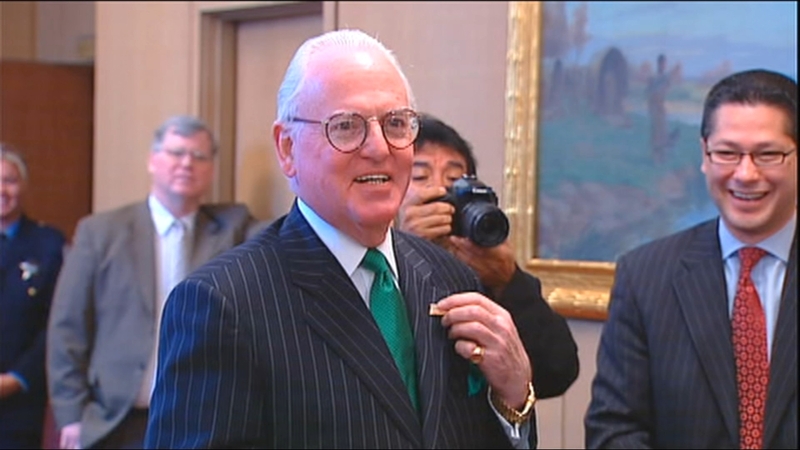 CHICAGO (WLS) -- A pair of raids Thursday targeted powerful Chicago Alderman Ed Burke's offices at City Hall and on the Southwest Side. The 14th Ward alderman is laying low, as speculation swirls about what investigators may be after. It is a big mystery right now, but one thing is clear: the feds have put Burke squarely in their sights. Now many people are wondering if it's related to an investigation launched back in 2012. Arriving at home Thursday night, Burke said, "I have always cooperated in investigations, I will fully cooperate in this one. And I'm confident that there'll be nothing found to be amiss." It all started early Thursday morning, when building engineers were told to leave Burke's City Hall office shortly after 8 a.m. by people identifying themselves as FBI agents. The office doors and windows were papered over. Through a crack in the brown paper, a man in a suit could be seen sitting at a desk in the front part of the office. A second raid was conducted at Burke's 14th Ward office. At about 1:15 p.m., agents were seen leaving the ward office, wrapping up their work there earlier than at the City Hall office. "All it means is that they have sought evidence. But it doesn't not mean that anybody's gonna be indicted," said former federal prosecutor Mike Monico. Burke has been in office for nearly 50 years and is the powerful chairman of the Finance Committee, which oversees the administration of the $100 million Workers Compensation Fund for city workers injured on the job. In 2012, the City Inspector General sought to review the records, but was rebuffed by Burke. The Legislative Inspector General, which oversees the City Council, then tried to intervene. FBI agents on Thursday descended on the City Hall and 14th Ward offices of seemingly omnipotent, five-decade alderman Edward Burke but federal authorities declined to say why. But before that office could take any action, the feds swept in with grand jury subpoenas for the Finance Committee, which oversees the Workers Compensation Fund. The fact that Burke's Finance Committee office and his aldermanic office were both raided suggests the federal investigation is related to the finance committee's work. "As you know I've been involved in previously investigations, I've always cooperated, nothing has ever come of any of those," Burke said. The statute of limitations for any corruption charges that could stem from that investigation is five years. But a source familiar with these kinds of cases said if the feds can show in an investigation that there are continuing crimes, the statute runs from the last crime. Agents leaving the aldermanic office had no comment. When asked about the raids on Burke's offices Thursday, the FBI told the I-Team, "Our agents are executing search warrants at multiple locations today. We have no further comment." Assistant U.S. Attorney Joseph Fitzpatrick of the Northern District of Illinois also told the I-Team "agents from the FBI are executing search warrants at multiple locations today." Alderman Howard Brookins, whose office is right next door to Burke's third-floor office, said he had no idea what was going on, but was surprised by the timing of the raid - this close to the Feb. 26 election. "I listen to the news and read the papers and I thought that they didn't do anything that close to an election. So it was shocking to me, just how or why something like this would happen some 90 days before an election," Brookins said. The 14th Ward, which was once largely white, is now predominantly Hispanic. He is facing four opponents in the February election, but did not seem worried voters would kick him out. "I am certain that they know that I am a person of integrity and honesty," he said. Burke has served on the City Council since 1969. He is married to a member of the Illinois Supreme Court, Anne Burke. At this point no charges have been filed and no one has been arrested. What remains to be seen is if federal agents take any further action before the February 26 election.